It will probably take a few more weeks to get settled back into some sort of regular schedule here on URC Psalmody. God has been good to us here on Long Island, however; my family’s electricity was restored on Monday night, and internet access returned yesterday. Thus, it’s with great pleasure that I can finally present you with the next installment in our sequential discussion of Sing a New Song: Recovering Psalm Singing for the Twenty-First Century, edited by Joel Beeke and Anthony Selvaggio. Today we consider Chapter 8 by Malcolm H. Watts, entitled “The Case for Psalmody, with Some Reference to the Psalter’s Sufficiency for Christian Worship.” Watts’s chapter is thick and often technical; nevertheless, I think we managed to mine from it some interesting and very applicable points of discussion. But there’s a twist. In the past we’ve presented transcripts of our instant-messaging “conversations” on Sing a New Song. This time, we coordinated the discussion with my visit to the Chicago area a few weeks ago, and video-recorded it on the campus of Mid-America Reformed Seminary! URC Psalmody’s entrance into the video world has been a step into new but exciting territory, so if you enjoy this discussion, please spread the word and share the link! And any thoughts or comments you might have, whether posted below or on YouTube, are always welcome. And now we present “Singing Sufficiency”: a discussion on Chapter 8 of Sing a New Song. Jewish temple worship? Non-inspired Old Testament songs? New Testament hymn fragments? If you’ve ever been confronted with arguments about these elements when discussing corporate worship, you need look no further than Chapter 5 of Sing a New Song for a thorough, well-measured treatment of such tricky topics. Rowland S. Ward’s essay on “Psalm Singing and Scripture” forms the fifth chapter in this book, which we’ve been systematically reviewing here on URC Psalmody since the beginning of September. JDO: I guess the first thing I learned from this chapter was that singing has only been an official part of worship since the time of David. Before that, singing was of course a common practice (think of Moses and Miriam’s “sing-off” on the shores of the Red Sea), but it was really in David’s time, when worship was formally organized in Jerusalem, that singing became a central component. Ward’s point is that “the songs of worship in the temple were not considered matter for mere human prescription.” David was clearly aware of the inspiration of the Holy Spirit in his psalms (cf. II Sam. 23:2), so it makes sense that the Israelites would use those songs in the corporate worship of their holy God. While they may have written and sung their own personal songs in other contexts, in the official worship service it seems clear that they stuck to the psalms. In brief, Jesus Christ is the tuning fork by which we pitch the Psalms correctly. We will find Him in them in various ways, not just in a few psalms, but in all the psalms. The believer’s union with Christ, the true David, is the key to unlocking the treasures of the Psalter. It is also the reason that these songs have a special place in the New Testament church and are so frequently quoted. Because Christ used the Psalter throughout his life and ministry, it is not “pre-Christian” or “sub-Christian.” Rather, as the early church recognized, “the Psalter was full of Christ” (p. 84). JDO: Ah, Michael, you’ve hit on one of my pet peeves. I’ve heard arguments against exclusive psalmody that run like this: “Now that Christ has come, we need songs that are explicitly about him. The Psalms may hint at him, but in light of his coming we need new songs.” That is patently false and shows a great misunderstanding of the book of Psalms, which Christ himself would oppose (cf. Lk. 24:44). What I discovered was that my hymn-based musical background was coming back to haunt me. Hymns had always been the “norm” in the churches I had visited, the discussions I had had, and the books I had read. Despite my months of loving, studying, and blogging on the Psalms, the rug had never been pulled out from me so suddenly before. Honestly, Ward’s excellent biblical analysis was like a bucket of cold water in the face. It dawned on me as never before that the Psalms—not hymns—are the origin, the pattern, the very basis of congregational singing. What a change in perspective! JDO: Once our perspective on worship becomes God-centered rather than self-centered, the Psalms will naturally come to the forefront. It’s only when I started studying the theology of worship in earnest that I began to love the Psalms. I’ve come to the point where I’d rather argue against singing too many hymns than ever try to convince someone not to be an exclusive psalmist. But it took me a long time to get there—precisely because I had been brought up singing so many hymns and loving the emotionality of them. MRK: How I pray that hymns would cease to dominate the music of the Church and that we would return to the Psalter as the foundation for corporate song! Only then can hymns and non-inspired songs assume their proper place. JDO: And the more similar our hymns are to the psalms, the better off we’ll be. MRK: Having shared that personal epiphany, we now turn to Ward’s next section, in which he analyzes the practice of singing in the New Testament. His discussion is divided into three areas: (1) specific references to singing in the New Testament, (2) actual songs present in the text, and (3) hymn fragments embedded in the text. What then, brothers? When you come together, each one has a hymn, a lesson, a revelation, a tongue, or an interpretation. Let all things be done for building up. If any speak in a tongue, let there be only two or at most three, and each in turn, and let someone interpret. Now Ward goes on to make a potentially ambiguous statement in regard to this passage: “If we take ‘a psalm…a doctrine…a revelation’ as aspects of prophetic utterance, as seems probable in the context, then we have a Spirit-inspired composition but perhaps not necessarily a composition from the Psalter, although such is inspired.” What does he mean by this? JDO: The context of I Corinthians 12-14 deals with prophecy and speaking in tongues. This was a time in redemptive history where actual Spirit-inspiration was still happening. Thus, someone could have a new song, prophecy, or tongue under the same inspiration as that of David or Isaiah or Paul. After the age of the Apostles, such events ceased. So what Ward is saying is that even though special inspiration does not happen today, the principle of singing Spirit-inspired songs is still in effect. For us, that means the 150 inspired Psalms. More broadly, Ward uses I Corinthians 14 to point out that all our worship, including music, must satisfy the criteria of “intelligibility, edification, and decent order.” Notice that “emotional stimulation” is not one of them—the emotions should arise from the truth of the text, not from our own sentimentality. MRK: Certainly. And I thank God that “intelligibility, edification, and decent order” are some of the primary tenets of the Reformed principle of worship. Ward’s next references are possibly the most-quoted musical passages in the entire New Testament: Ephesians 5:19 and Colossians 3:16, which both command the churches to sing “psalms and hymns and spiritual songs.” He makes four well-measured observations regarding these passages. “The meaning of the three terms cannot be distinguished in actual usage” (p. 86)—that is, psalms, hymns, and songs are not really different categories. “Psalms are about the Father, hymns about the Son, and songs about the Spirit”—this and similar interpretations are simply not viable, either logically or linguistically. It’s most likely that Paul is directing the church to sing these Psalms, or at least songs like them. On the other hand, these three terms cannot be limited with absolute certainty to the Psalter; Ward admits that “the terms may be general in nature.” While all three terms seem to refer to the Psalms, the argument that they refer only to the psalms is flawed. Of course, the practical application doesn’t change: the Psalms should have the principal place in worship. The adjective “spiritual” modifies all three terms, that is, “spiritual psalms, spiritual hymns, and spiritual songs.” Ward interprets the term “spiritual” to mean either strictly “Spirit-inspired” or loosely “Spirit-prompted.” The former reading would limit church music to the text of Scripture; the latter would allow for non-inspired songs based upon the Bible. Ward clarifies that the setting of these passages is communal and may not apply to private worship in the same way. JDO: Regarding the last point—Christians can feel free to sing whatever they want at home (with wisdom and discernment), since these passages and arguments for psalmody refer mainly to corporate worship. MRK: What comes to mind first is a negative implication of this principle: The entire church suffers when attempts are made to drag private devotional practices into corporate worship. JDO: That’s the problem of self-centered worship again. Let’s say that I am personally blessed by listening to Latin masses written by Haydn while burning incense. What if I were to say, “Since it blesses me, I should bring it into church”? We’d be back in Rome! MRK: That’s an excellent observation. Interestingly, though, the reverse is actually beneficial: a solid psalm-singing tradition has great benefits in the home as well as in the church. So we must be aware of this distinction, and be sure we understand and appreciate God’s regulations for corporate worship. JDO: Ward concludes this section by stating that regardless of one’s interpretation of “spiritual,” the hymns and songs that stick closest to God’s Word that are the most beneficial for our worship. Naturally, the wisest course here is also to keep closely to the meaning of Scripture, if not its very words. Thus the new songs, though not formally canonical, can be regarded as accurately conveying the truth of God and thus of devotional value and spiritual profit along with material directly in the text of Scripture. MRK: Ward moves on to briefly consider the songs present in the New Testament text. Of the songs of Mary and Zacharias he comments, “I have always found it surprising that one should argue for their regular use in public worship given that it is so obvious that they are unique songs for unique personal situations” (p. 89). How does this line up with the old Dutch Reformed tradition of singing the songs of Mary, Zacharias, and Simeon in public worship (Psalter Hymnal numbers 332-334)? JDO: I actually agree with his statement: it is kind of weird to sing their songs, because they are very personal. But what’s neat is that all of these songs are almost entirely quotes from various psalms—so, in the end, these New Testament songs just prove the vitality of the Psalms in the life of these saints. MRK: Ward also examines the songs present in Revelation, and while his arguments get a little complicated, the main point is the same: Even in heaven, the saints’ songs to God draw heavily from the Psalms—testifying yet again to their enduring quality and relevance to Old Testament and New Testament alike. Devoting less than one page to the final section of his survey of New Testament music, Ward concisely summarizes the oft-mentioned issue of “hymn fragments” in texts like Ephesians 5:14, Philippians 2:6-11, Colossians 1:15-20, and I Timothy 3:16. His twofold response to this argument is direct but insightful. “It is not clear what is established even if these are hymn fragments” (p. 90). In more colloquial English, “So what?” These passages do nothing to prove or disprove the existence of non-Scriptural hymnody in New Testament worship. “Is it not possible to mistake memorable passages of great eloquence for hymns?” Nothing in the Greek text suggests that these passages were based on any discernible poetic structure. Ward concludes that the “identification of hymn fragments is hypothetical and of limited validity.” Instead he points us once again to the Psalter. In summary, Ward’s chapter is both fair and complete. While he doesn’t necessarily argue for exclusive psalmody, he makes a clear case that “if we lose sight of the norm of praise in the Psalter, we are likely to drift very seriously. By the same token, the hymns that tend to endure are those that stay most closely to Scripture themes and language” (p. 91). MRK: Right. Just as we’ve emphasized time and time again on URC Psalmody, the Christian church can never sing too many psalms. The central question is not, “Should we sing only the psalms?” but “Should we sing the psalms?” And the answer is a resounding YES! The sole factor in evaluating the music of the Christian church should not be servitude to human preferences but grateful obedience to God’s commands. [W]e should not forget that God has always been very jealous of His worship. He has the right to fix its nature, and our response can only be one of obedience in the context of His gracious covenant. The Reformed Presbyterian Churches of North America (RPCNA) have an absolutely incredible history of God’s faithfulness to His people. Arising from the Covenanter movement in 16th century Scotland, the first American RP Church was founded in Pennsylvania in 1743, with the first presbytery (similar to the URCNA’s classis) being organized in 1774. Although there have been some rough passages in their history since then, the RPCNA has remained almost unbelievably faithful to their principles and roots. The RPCNA is a confessional Reformed denomination, faithfully holding to the Westminster Standards and upholding the infallibility and inerrancy of Scripture. True to their Covenanter roots, they are identified by their well-known “For Christ’s Crown and Covenant” banner, which is also the origin of the name of their publishing house, Crown and Covenant Publications. The RPCNA has a wonderful college, an excellent seminary, and very effective missions. More Germaine to this blog is their consistent singing of the 150 biblical psalms. The RPCNA is an exclusive psalmist denomination, believing that the correct application of the regulative principle of worship is that the church’s “musical praise employs God’s Word only, thus making use of the divinely inspired Book of Psalms.” Also notable is their practice of singing the psalms a capella, without musical accompaniment. They maintain this practice in order to encourage “keeping with the New Testament Church’s directive for heart worship,” that is, to remove any distraction from “singing and making melody to the Lord with all your heart” (Ephesians 5:19). In light of the URCNA’s Synod 2012’s recent discussion of entering “phase 2” of fraternal relations with the RPCNA, Michael asked me to take a few moments to reflect on my relationship with the RPCNA. There are many nuances to Synod’s discussion which I do not intend to delve into. This blog is about Psalmody, after all, so that is where we’ll stay. We’ve discussed exclusive psalmody on this blog before (and can discuss it further in the future), but today, I’d just like to focus on the richness of the RPCNA’s heritage of singing the psalms. To be honest, I never knew of the RPCNA’s existence until I went to college. There, I became intimately familiar with the denomination; in fact, most of my best friends were (and are) members of the RPCNA. Through my friends, and the experiences I had worshiping at various RPCNA churches, I came to love and appreciate that denomination. Being Scottish in background, the RPCNA uses Psalters that are rich in the heritage of Scottish Psalmody. From the historical roots of the Scottish Psalter (1564, revised by the Westminster Assembly in 1646 and approved for use by the Church of Scotland in 1650), the RPCNA enjoys a rich tradition of excellent Psalters. The Scottish Psalter went through a few reprints and was completely overhauled into The Book of Psalms for Singing in 1973 and most recently The Book of Psalms for Worship in 2009. All of these Psalters are rich and faithful to the biblical Psalms. Although these Psalters are from a Scottish, rather than continental, background, readers familiar with the Blue Psalter Hymnal and its family tree would probably recognize many of the tunes and phrasings, as the Scottish Psalter was one of the sources for the Christian Reformed Psalter and Psalter Hymnal. I personally found the English and Scottish tunes to be easy to learn, robust and rousing. Although I found the a capella singing to be a bit unusual and surprising at first, I have never been to an RPCNA congregation that doesn’t sing (I mean really sing!). These churches take their psalm-singing seriously, and some of the most musically beautiful and heartfelt praise I’ve ever been a part of has taken place in RPCNA churches. From young to old, each member belts out the words of Scripture in time-honored harmonies. Whether singing in a service or around a campfire, it’s clear that each member of the RPCNA is brought up to cherish and love the biblical psalms. It was from RP church members that I really learned afresh to love the psalms and the singing thereof. I’ll never forget a Sunday afternoon I spent with a handful of my Covenanter friends. I was asked to close the meal with a Bible reading, and I chose to read a psalm. For whatever reason, I neglected to announce which psalm I was reading. But immediately following the reading, several of my friends chimed in with the reference. Thinking it was a fluke and that I could stump my Scottish brethren, I started a little game. I would read what I thought was an obscure passage from the psalms and make them guess from which psalm it came. With alarming accuracy, my RP brothers and sisters nailed the psalm references. Now I’ll lay my cards on the table: I enjoy singing hymns. I think they are an appropriate and glorious way to express Christian joy, even within the worship service. But seeing what such a solid tradition of church psalmody can do really impressed on me the importance, the crucial necessity, of singing the psalms in worship. We’ve listed so many reasons to sing the biblical psalms on this blog. Another reason (among many) that I learned from the RPCNA was that we must sing the psalms in order to foster a love of the psalms, in order to memorize the psalms, in order to think in the language of the psalms, as I’ve seen demonstrated time and again by my RP friends. I benefited (and continue to benefit) so much from my acquaintance with the RPCNA. If that benefit on a small, personal scale can be reflected on a federational scale (in whatever stage of fraternal relations) with the URCNA, then praise God! 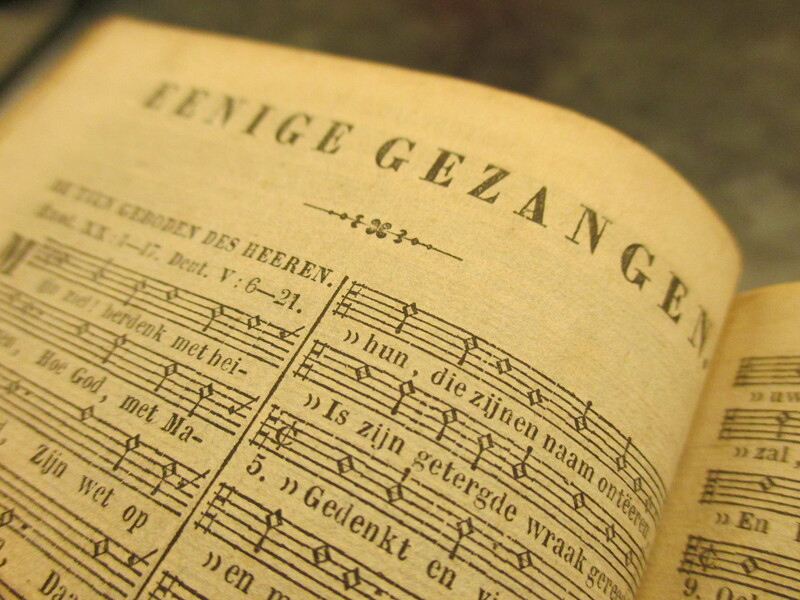 Don’t get me wrong, the Dutch Reformed background of the URCNA contains its own rich heritage of psalm-singing. But if we can catch the zeal and exuberance that the RPCNA has for the psalms, we will be richer for it. I learned to love Christ more passionately through the psalms from my friends in the RPCNA. Let’s be clear – the URCNA and the RPCNA are not identical twins. But at least in the area of psalmody, let us celebrate and enjoy our fellowship with this rich and historic denomination, for they have much to teach us.